Let’s just say I’m too old to have gotten a time out so I could think about my actions. My dad was a “you didn’t learn your lesson unless you’re crying” sort of parent and I was a “you’ll never break me” sort of kid. It worked well. Especially if the goal is a lifetime of angst and discord, plus lots of broken wooden spoons. I’d do some sort of infraction that would equal a spanking and at some point in the process, the testament of wills would become all that really mattered. What would tire more quickly? His arm or my anger? Finally, I decided it made more sense to incorporate a theatrical approach and I’d make myself cry after a few whacks because what was the point, really? My infractions were of a tame sort: I broke a jar of ketchup, or dawdled doing my chores, or later, argued with something he said. He’d spank and I’d let the tears fall after 3 or 4 smacks. But inside, I wasn’t crying. I was cursing. I was railing against the futility of the whole thing. My mom, on the other hand, would yell at me and I’d feel terrible about it for weeks. She’d give me the silent treatment and I’d beg her to forgive me. I, it seems, am less impacted by physical pain and much more impacted by emotional pain. And that remains true to this day. I almost always hurt–a headache, or back pain, or my trick shoulder acts up. It’s to the point that I don’t really notice it until I can’t ignore it. I have become a master ignore-er of aches, pains, and minor irritations. When I have major deadlines, I don’t sleep until I have things done. If I get sick, I just take some pain reliever and carry tissues with me. Even a sprain or surgery slows me down as little as possible. I guess it’s fair to say I don’t take very good care of my physical self because I learned long ago to ignore it. But the emotional stuff? Holy whoa can that sideline me. And when that happens, I need a time out. The older I’ve gotten, the more I’ve realized that when the body pays the price every day, eventually the spirit does too. And while I tend to ignore my body’s little calls for attention, I can’t do the same for my spirit. So I’m taking a time out this week. 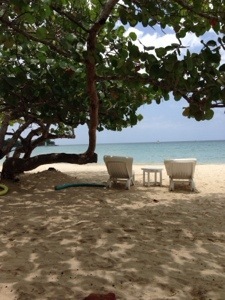 This entry was posted in Front Page and tagged Jamaica, taking a time out, vacation by kristina. Bookmark the permalink.